Happy Friday to you all! Wow, this is maybe the latest ever that I've posted my Friday Favorites. It was a busy day...had to ship a bunch of packages, get organized, clean up the studio, and then start all over again to get stuff prepped for shipping on Monday. No matter what...if you work in an office or work for yourself...one thing is certain...you cannot escape the grind. But that's life...and I'm not necessarily complaining. Truth be told...you should be happy to even have a grind. In today's world the grind is a gift. And in thinking of the day-in, day-out worker bee existence that we all are required to have, it got me thinking about what these Friday Favorites actually mean to me...and how I'd like for that meaning to be passed on to all of you guys. Well, for starters, they indicate the end of the work week for most of us...and that in itself is a reason to rejoice! But for me they also are illustrations of why we suffer the grind. These are the types of things that we all work for. Some of them are things that you shop for with your hard earned paycheck...but a lot of my Friday Faves don't have a price tag...they simply require your time. And that's a big reason why we work...to buy ourselves some TIME. Some time to do wonderful things and bake amazing things like the Lemon Almond Torta above. I see the way my beloved little brother Walter handles his grind. He'll get home from a very long and arduous workday and upon hopping out of the work van he won't even make a pit stop into our house...he'll head right into his workshop and work for hours on rebuilding an engine or polishing some chrome. Some would say that he's nuts...but I totally get it. The work he does in his workshop is his passion. And the hard day that preceded it is how earned the time to undertake his passion. So once again...a big Happy Friday to all of you! You earned it. I hope these Friday Favorites remind you of all the reasons why you work as hard as you do. Get a load of this DIY Stump Table... I absolutely love this! Seeing this come together from start to finish had me grinning from ear to ear. I came across it on Pinterest and I'm so happy that it led me to this duo's blog. They go by 17 apart, which happens to be their age difference, and they've got so so many super fab tutorials like this one. I have always been head over heels (pun intended!) for leopard print! I incorporate leopard print into my wardrobe as a neutral. In my opinion, it goes with everything. For real, going back more than 15 years it's been a mainstay in my look. So when I came across these Leopard L'amour Wedges which I found on the brand new and ohhh so fabulous Hello Holiday I just knew that I found my newest fashion destination. 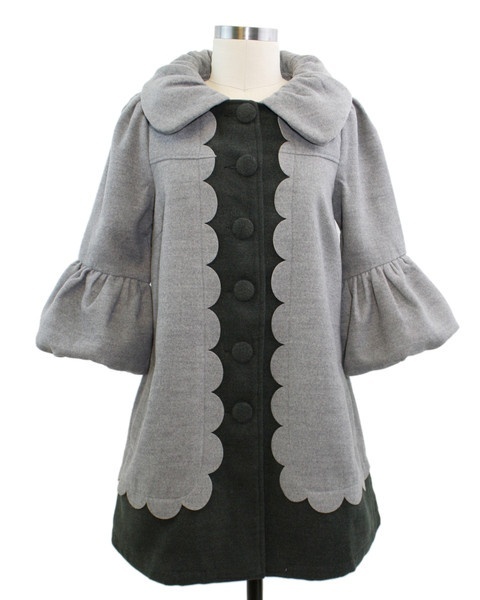 And as if the wedges weren't enough Hello Holiday had to go and dazzle me with this: The Earl Grey Coat ! Oh wow...it is so so me! The cut, the lines, the length, the scallop...perfect for this wonderful season. And what better way to finish off my Friday Faves than with a necklace?! The right necklace can take a look from blah to beautiful. And I think this one has what it takes. It is from Saints & Sinners by Barbe Saint John. I love everything about it...kinda looks like a wearable Art Journal. Ok, hope you enjoyed these Friday Favorites! All apologies for how late they posted. I wish you all a fun filled, inspiring weekend. I love that coat! I just wanted to stop by an say hi.. I seem to repin a lot after you!!! Ohhhhhhhh these are all awesome ... but I am LOVING that table and necklace the best!!!! Thanks for including my necklace!!! I always love seeing your curated collections every Friday and am thrilled to be included!!! I really like your concept of doing the daily grind to buy TIME for us. I get home after a long day of teaching and hit the studio for a little creative jolt. That's my idea of nirvana. Thanks Jenny! @Jennifer Rizzo Hi! Thanks so much for popping in! Gosh I know! This coat is the cuuutest! I would LOVE it! Just so happy and sweet and FUN! Such a stand out..yet would work with almost everything I own. Loving Hello Holiday right now! And yes...that necklace is just beautiful! @ Barbe Saint John Hey there you sweet and talented thing you!! Gosh I adooore this piece! Your work is fantastic!! I just had to share! I hope to own a piece one day soon! Maybe custom?! @Lisa Cook Hey Lisa! Lovely of you to pop in! So true isn't it? It's what keeps us going...and keeps us loving the little things. Happy Art Making! @ vintage grey Gosh doesn't it look perfect? I would love a big bite of it right now! Sometimes you need something a little different...other than chocolate. I adore almond flavored things! I hope to make it soon! Happy Weekend! Thank you for visiting! WOW, just stumbled upon your blog and feel as if I have found a kindred spirit...everything....and I am your newest follower!!! You are amazing!